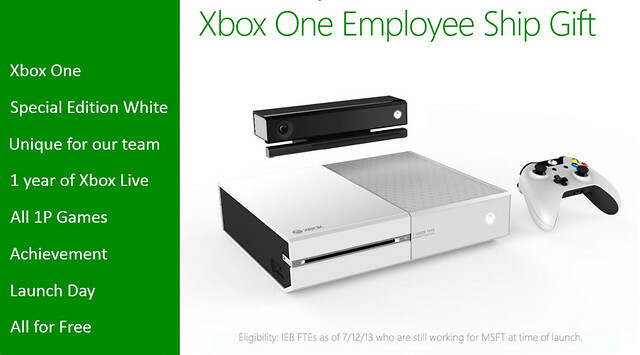 Xbox One Employee Only White Edition Console? If the rumours are true, Xbox One employees are in for treat with Microsoft supposedly giving out Xbox One white consoles to staff that have worked on the upcoming Xbox One. The original image surfaced on Reddit, and features a white variant console to be given to employees working in Microsoft’s IEB (Internet Entertainment Business) division, the team responsible for Xbox. The console is engraved with “I MADE THIS” on the front and is sure to attract attention from their family and friends to see the white beauty sitting plum and center under their home entertainment setup. It also comes with a matching white on black controller and the all-new Kinect, which interesting is in black. In addition to the console, each member will also receive one year subscription to Xbox Live and all first party release launch games. Eligible staff will need to have worked in the Microsoft team for at least a year to receive this amazing gift. Whether or not this Employee Only console is true or not, the image has sent the internet into a furor as the majority of fans agree the white paint job is more appealing than the black finish. Why a white version was not made as a Day One Edition instead will forever remain a mystery to me. Details on if, or when this colour variant will be available is uncertain, but if the rumour is true they should be handed out around the Xbox One launch sometime this coming November.